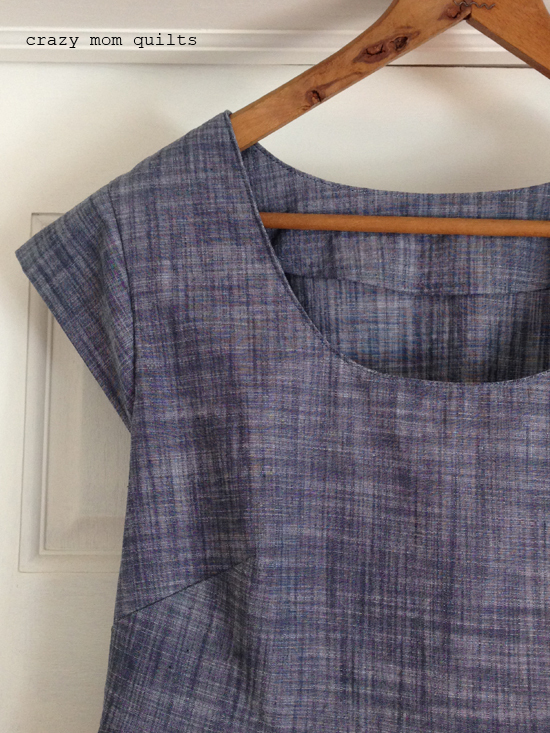 The pattern is called the Washi Dress and it's by Made by Rae. I can't recommend it enough! I'm very lucky to be able to sew up a size medium with no adjustments whatsoever, and it fits me perfectly. I realize that's rare...thus multiple dresses with the same pattern! The dresses are versatile. I wear them to church, out shopping and when I teach and speak. They are comfortable and can be dressed up or down. I love that! 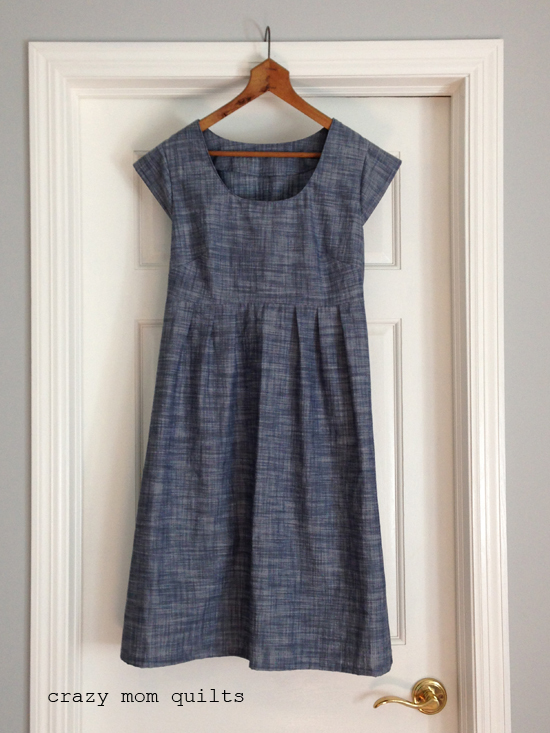 The fabric for dress #4 is Chambray Union Indigo by Robert Kaufman, which I purchased here. It's really lovely for a garment! The orangey red fabric for dress #5 was picked out by my friend Brianne. (It's pretty great to have a personal shopper! Haha!) 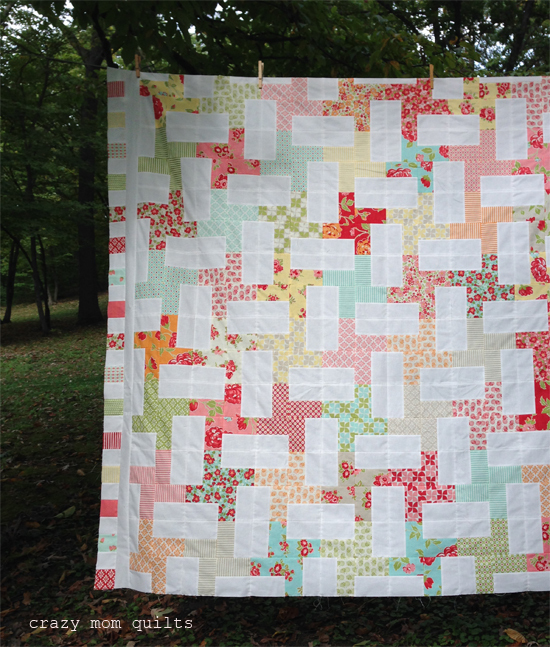 The print is called petal from the line Vignette, designed by Aneela Hoey for Cloud 9 Fabrics. It was purchased at SR Harris. The fabric is double gauze, which means that this dress is dreamy!!! I was worried about it getting super wrinkly after wearing it, but I had no problem. Yay! It's a fun dress for warmer fall days. I think my favorite part of constructing the dress is sewing the shirring on the back, which is made by sewing with elastic thread. I was so afraid of doing that part the first time, but it's like magic, I tell you. It's so satisfying. 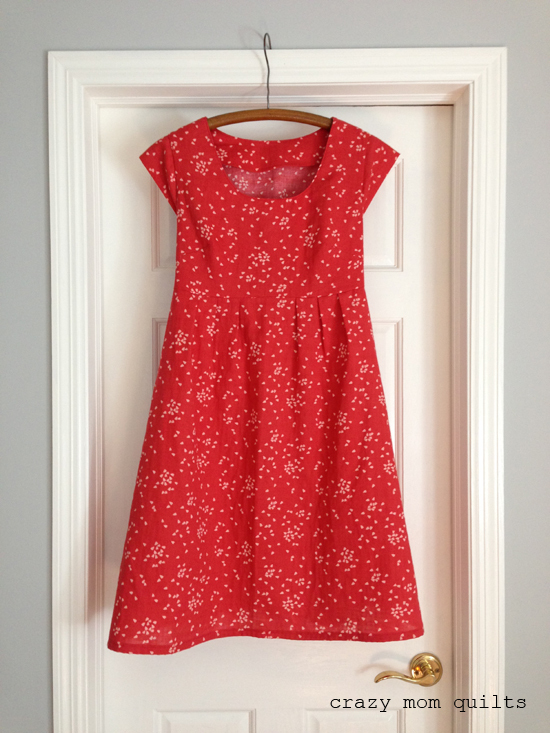 I purchased the geranium dress (similar pattern, but for girls) for my daughter last spring, but I haven't made her one yet. I think that's next on the garment sewing list! She's excited about it and I am, too. 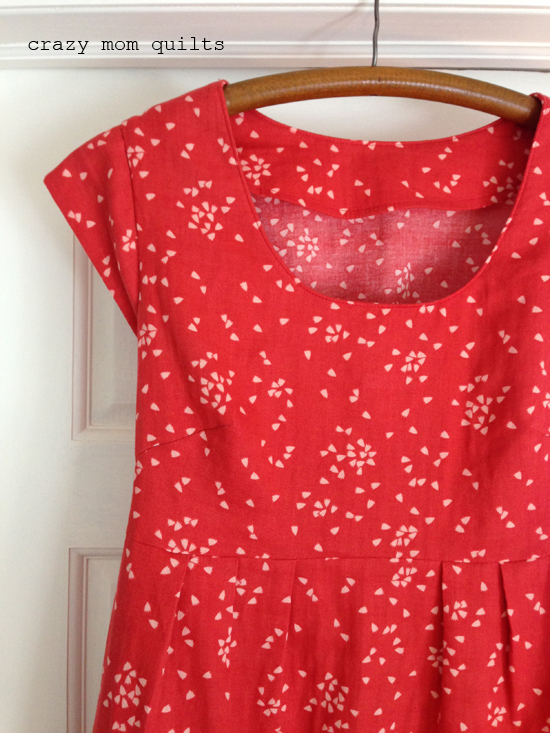 Do you sew garments at all? If so, what are some of your go-to patterns? I'd love to hear about it in the comments! One of my goals for this year was to do some designing and collaborating with my daughter. It's nearly October already (!!! ), so it's good to take a look back at those goals from January and see what still needs to be done for the year. Hahaha! This project started out pretty innocently, which I love. My daughter was playing with my bin of 2 1/2" squares and she started arranging them on the design wall. This is a design that she came up with and I absolutely loved it. She was delighted that I loved it enough to sew it up! I encouraged her to arrange another one, and yellow was next color she chose. And the green one was the third block that she designed. I helped her do some editing on the second two blocks, which actually went ok. (Phew!) We've been having fun making one block at a time. She designs, I sew. While it isn't a quick project, it's been a great one to work on together. She told me that she really doesn't like sewing, she'd rather just come up with the ideas and do the designing. (Hahaha! Gotta love her honesty!) She and I share the same love of aqua, obviously. 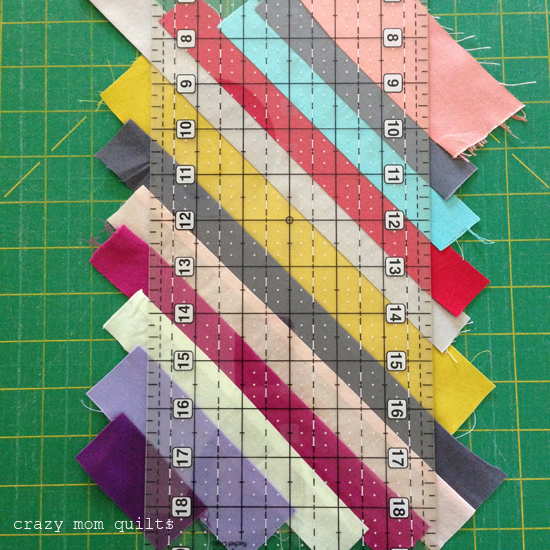 My plan is to come up with a second block pattern to combine with these blocks, so I can avoid doing any sashing in order to make a complete quilt top. 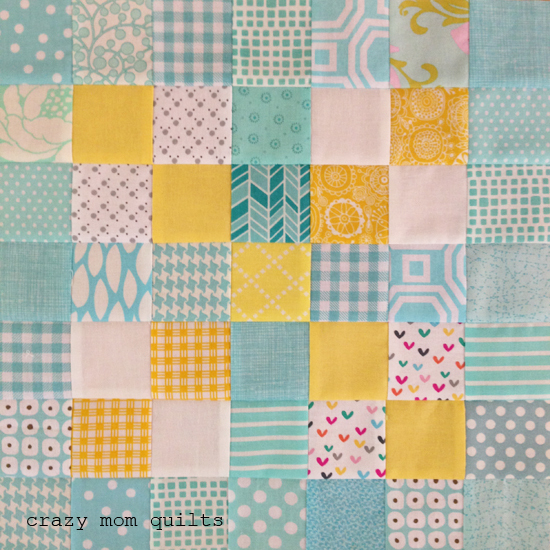 At the rate this quilt is coming together, there is no need to rush to come up with that second block idea...and I'm totally fine with that! Welcome to finish it up Friday! Boy, that came around fast, didn't it? I pieced most of the blocks for this quilt at a retreat this past summer. A few weeks later, I assembled the blocks together. This week I added the borders on the right and the left, increasing the size just enough to make it a twin size quilt. Woohoo! I used a much hoarded layer cake of Marmalade fabric from my stash...it's old, but it's so good! It was finally time to use it! (Fabric was designed by Bonnie and Camille for Moda.) Background fabric is Kona snow. The seams are all pressed open, which isn't my favorite method, but it will make quilting it easier at least! The FREE pattern is called Cartwheels and you can find it here. 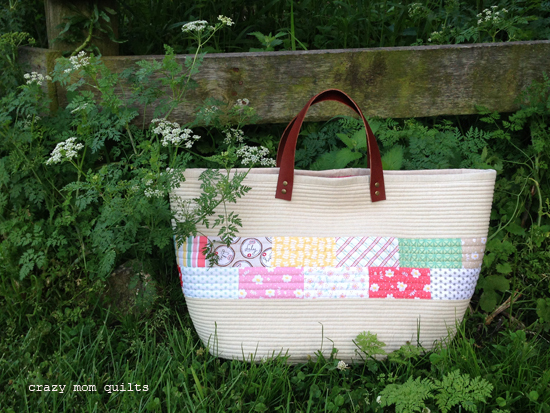 You can see my first version made from Strawberry Fields fabric here, if you care to. I'm excited to get this one finished up! Now, it's your turn! Please link up your finishes for the week. Thanks, as always, for joining me for finish it up Friday! 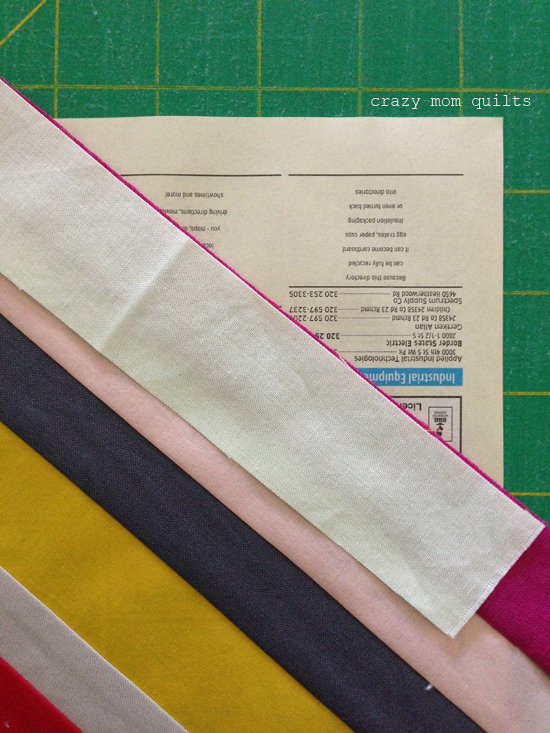 One of the quilts that I'm working on for my solids challenge is my biased quilt. I have had so much fun making the blocks, so I took some photos along the way that explains my process. I hope you find this tutorial useful. 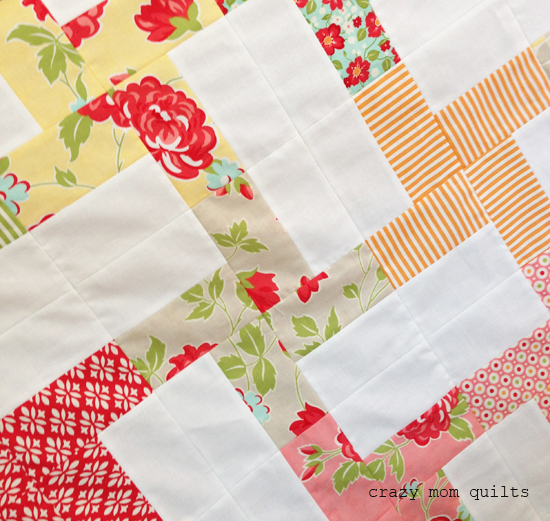 I can imagine this quilt stitched up in prints, too. I think it would be pretty fun! A scissors is optional, but helpful. Before you get started, you need to choose a block size. My unfinished block size is 10" high (because it was the height of the phone book) x 6" wide (because it is the width of my ruler). No need to make it complicated! 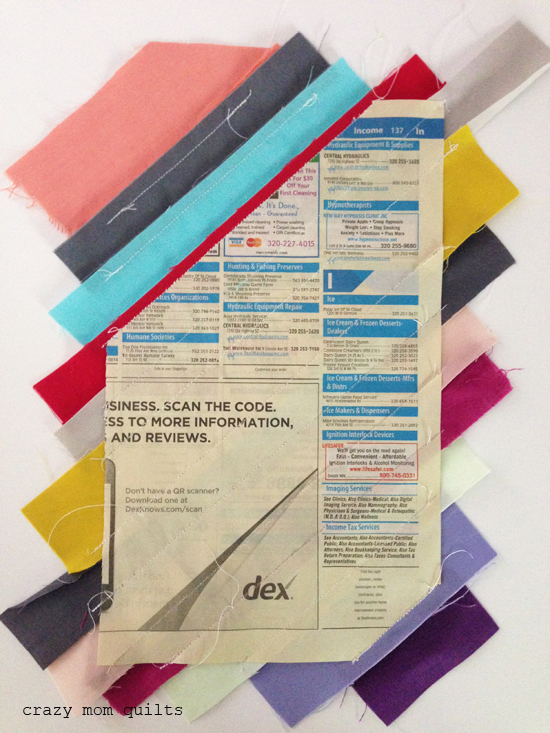 Cut all your papers to desired size. 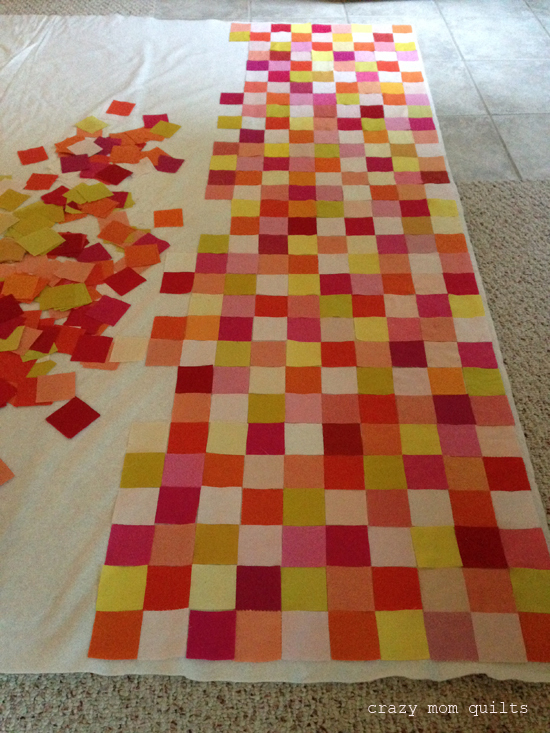 I'm making 88 blocks, so my quilt will measure about 60.5" x 76" finished. 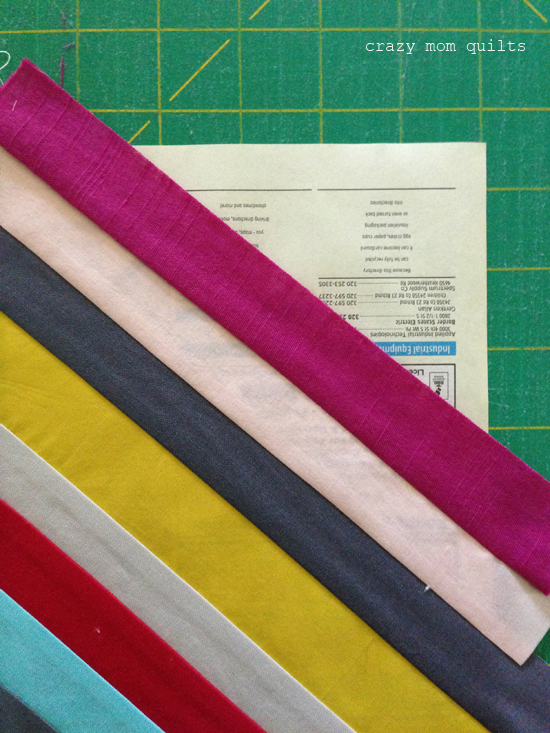 Please note, in most cases I used strings of fabric that measure between 1 1/8" and 1 3/4" wide. Take a glue stick and draw an angled line on the paper. (Sorry that you can't see the glue. It's transparent.) 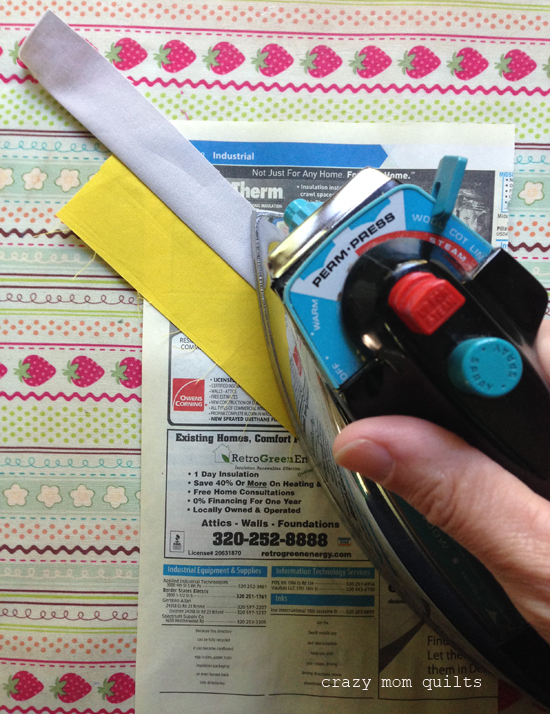 If you use enough glue to see it, that will be bad news for your quilt! You only need a bit to temporarily hold the fabric in place. 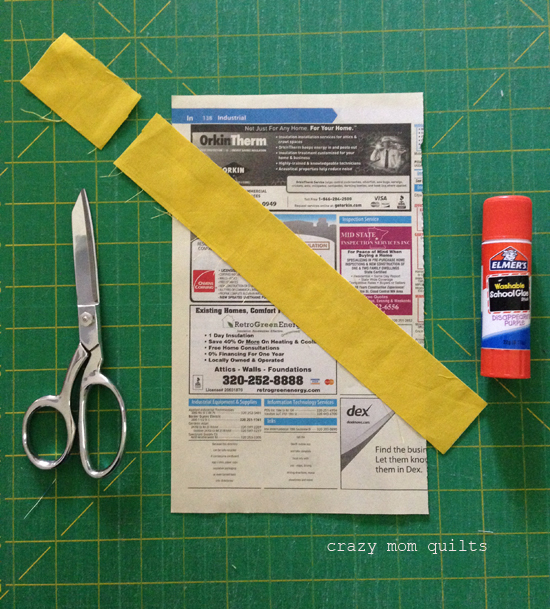 Place the fabric on the glue line and trim the extra fabric length with a scissors. 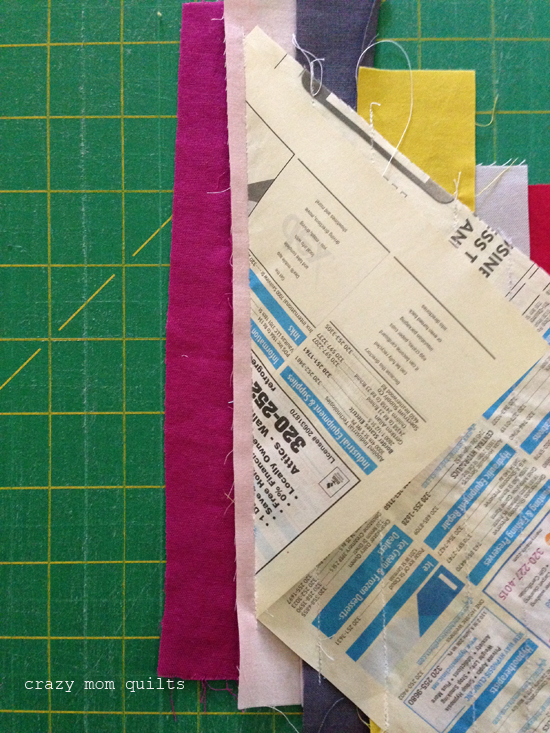 I like to trim my scraps straight, rather than at an angle, because I'm more likely to use the little bits that way. 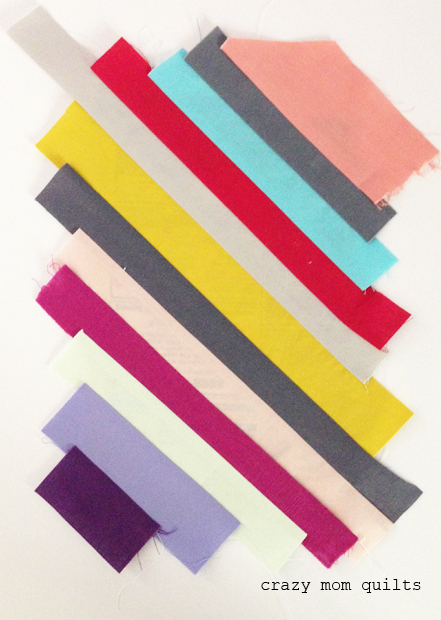 Choose a second string of fabric that coordinates with the first one. Cut to length. 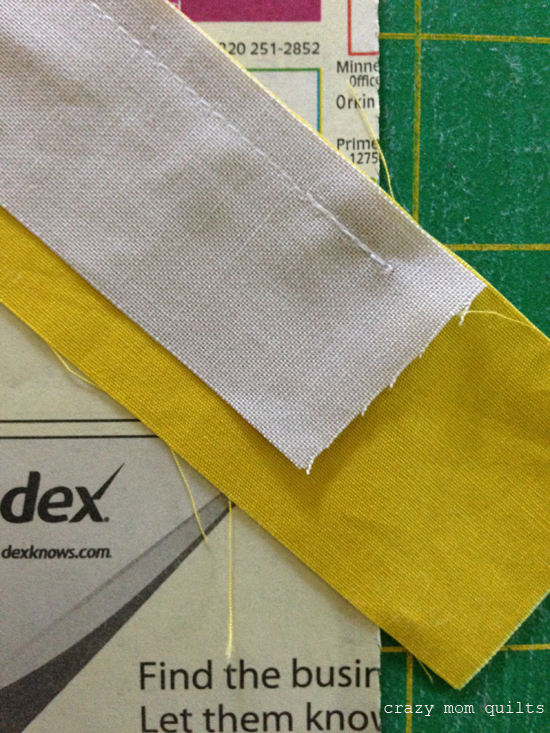 Align the edges of the fabric on one side and sew a 1/4" seam, using the edge of the fabric as a guide. 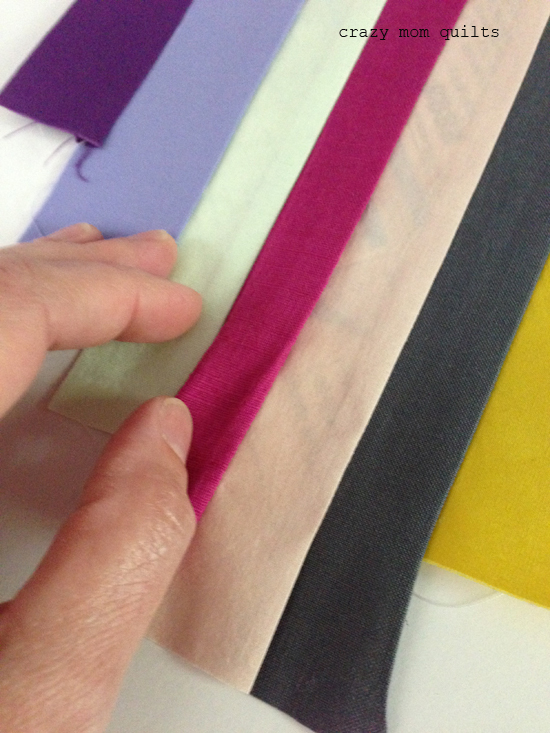 Press the second string of fabric away from the sewn seam with a hot, dry iron. 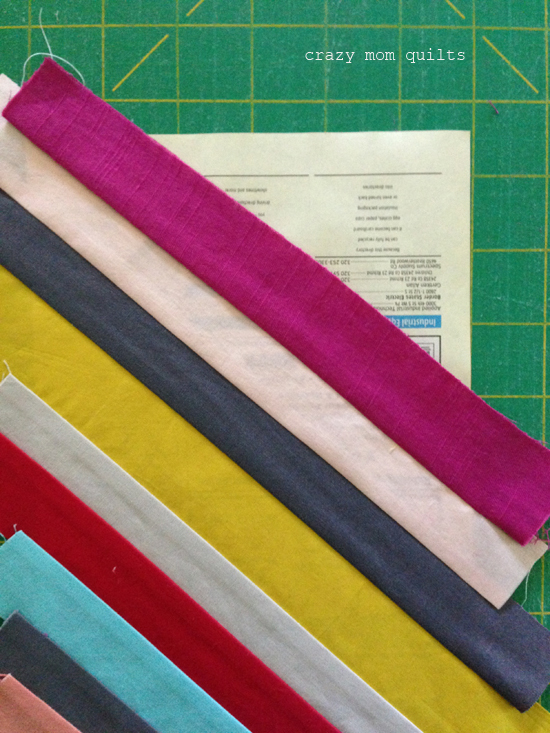 Select another string of fabric and cut to length. Make sure that it extends from the edges of the paper about an inch on either end. Repeat steps above to attach the third string to the block. 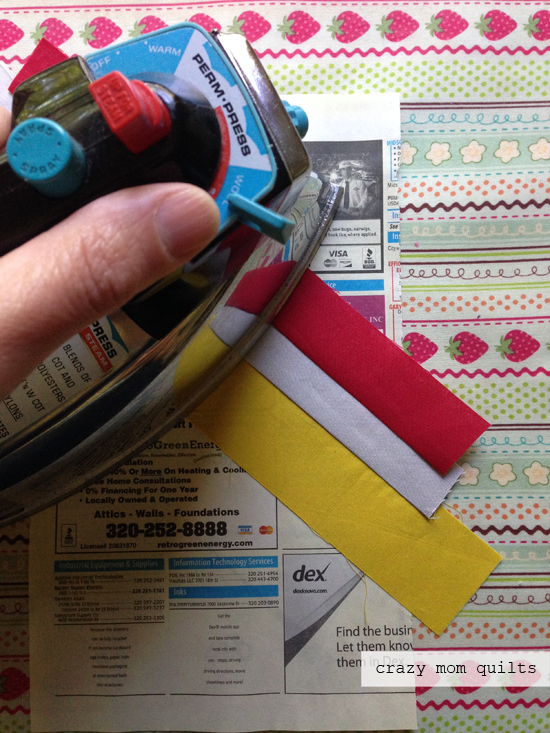 Continue to add strings to cover the entire corner of the paper, pressing after each addition. Remember to backstitch. 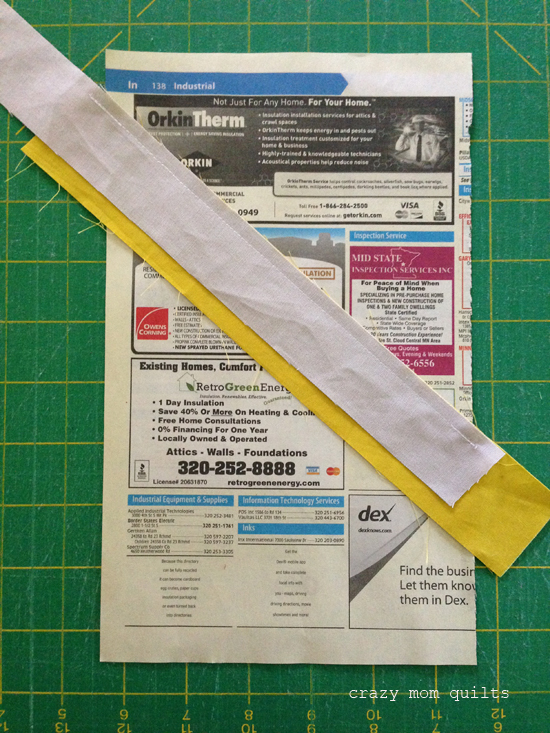 Once the paper is half covered, flip it upside down and add strings to fill in the remaining corner. Once the block is completely pieced, give it a good press. 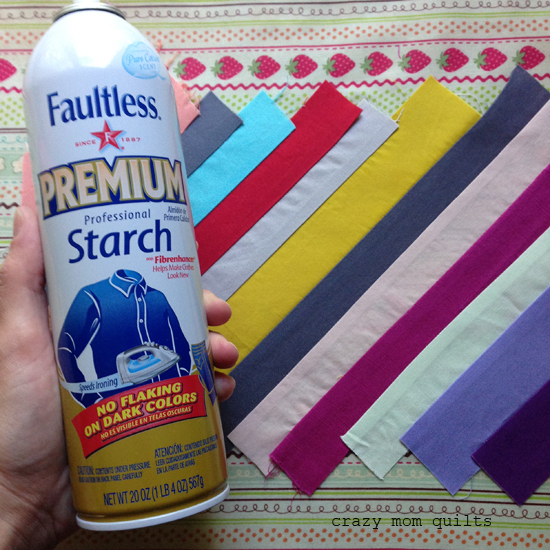 I like to use a little spray starch after the block is pieced to help stabilize it a bit. Now it's time to trim the block down to size. 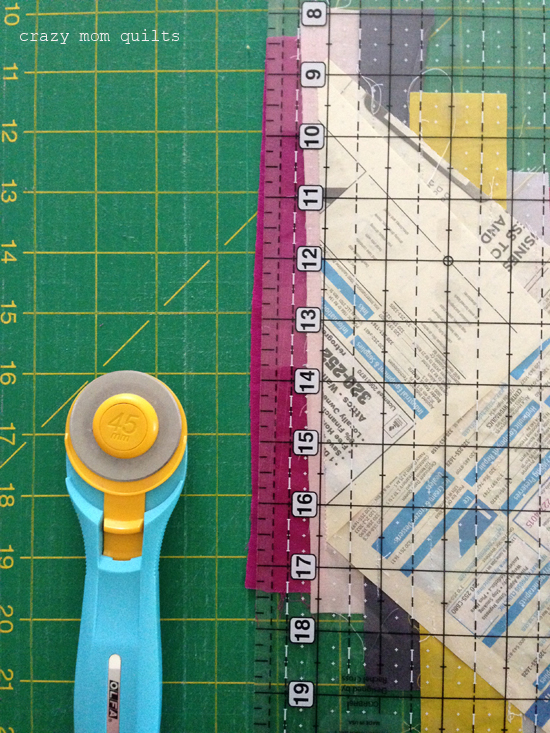 Place the block face down on a cutting mat and use the ruler to measure the block when trimming, rather than using the paper to measure. I've found that the paper shrinks up a bit when piecing, so this is a good way to get an accurately sized block every single time. Here you can see that the paper shrunk a bit...about 1/16 of an inch. Not a huge deal, but it sure is nice to sew blocks of the same size together. 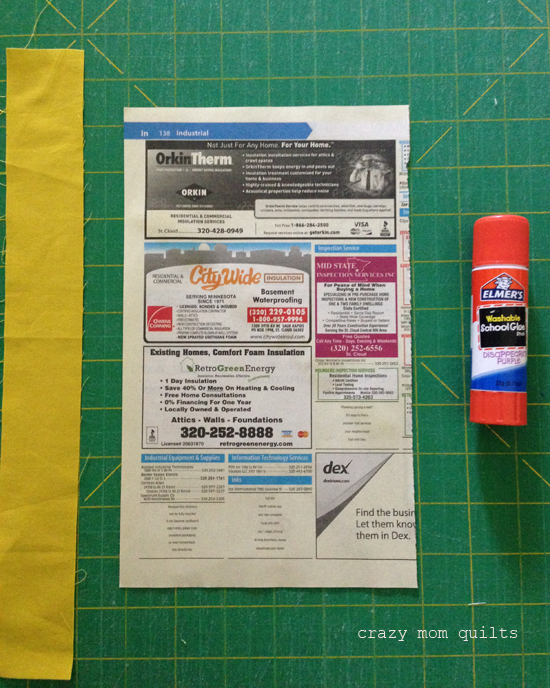 Once the block is trimmed down to size, carefully remove the paper backing. Your block is complete! Sometimes a strip gets a little wavy, for one reason or another. If that happens, it's not too difficult to fix. 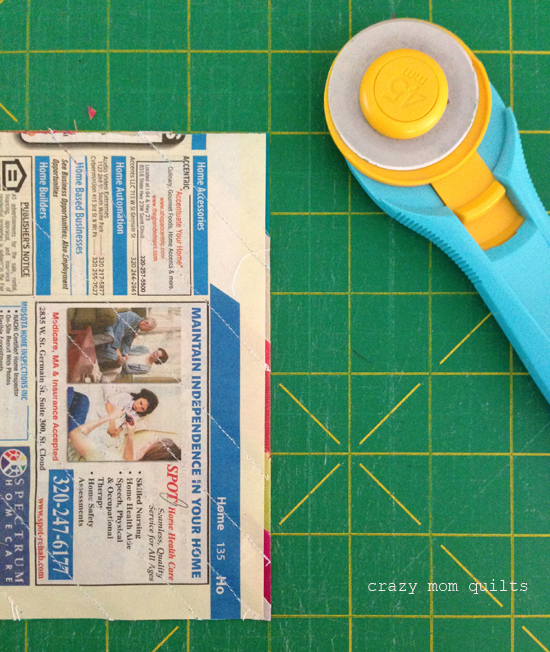 Flip the block face down and fold the paper back. 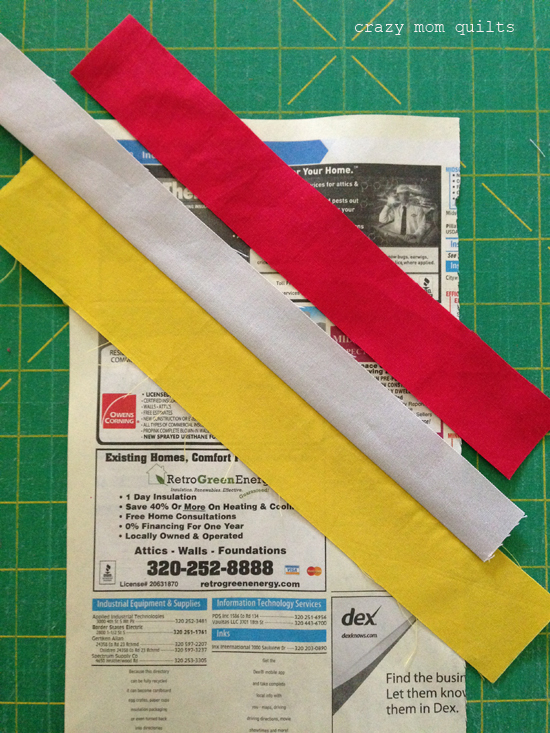 Use a ruler and rotary cutter to straighten out the fabric. 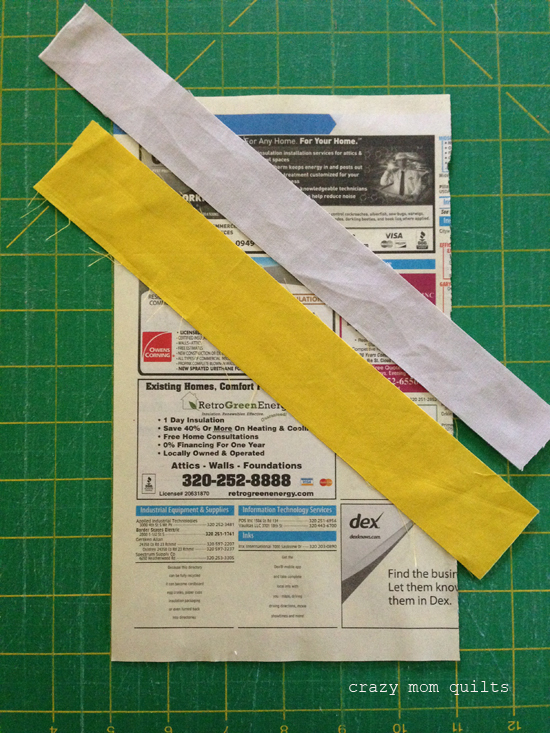 Fold the paper back into place and continue to add strings and strips to the block. Having a straight edge makes it much easier to add the next piece. TIP: When aligning a light fabric over a dark fabric, be careful to place the fabric on top ever so slightly over the edge of the dark fabric, to prevent shadowing. I removed the paper before trimming the block down, then gave it a good press to remove the wrinkle/crease. I was sure to use spray starch, too. Then I trimmed the block down to 10" x 6". In most cases, trimming the blocks before removing the paper is the way to go, although it is nice to have a way to fix it if things go awry. 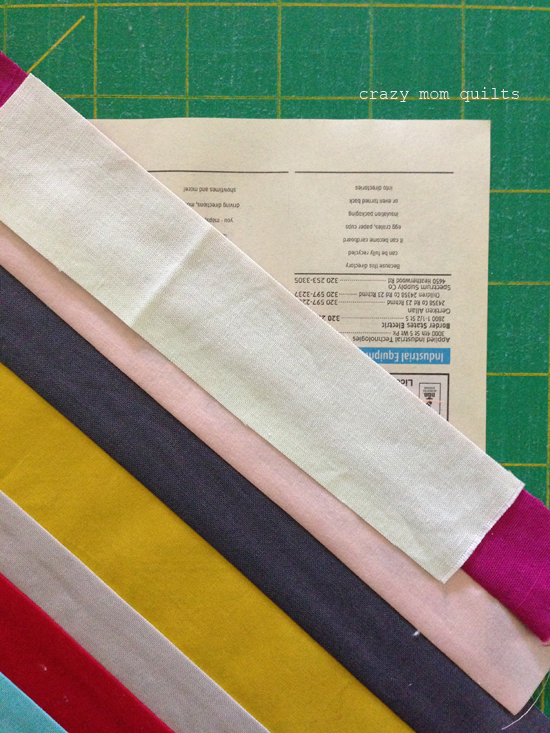 I had a few questions about how I select colors for my blocks, so I'll touch briefly on that. 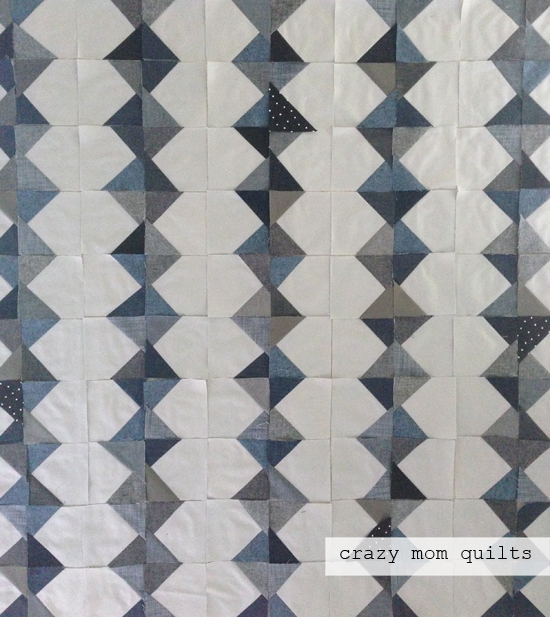 Generally, when I am piecing blocks like this, I try to use a mix of lights, mediums and darks. I do a lot of auditioning for each block. As far as what goes next to what, I try to let go of my preconceived color ideas, but I find that I do place the same colors next to each other over and over at times. 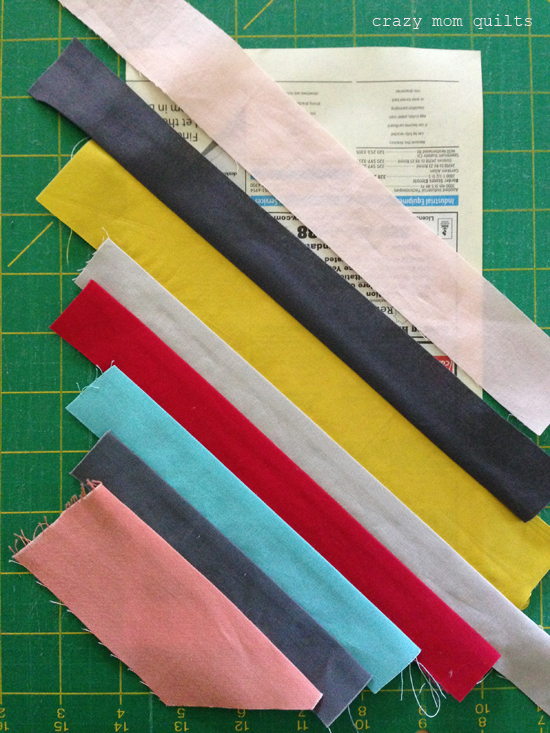 (I'm soooo not ready to blindly chose scraps out of a paper bag! I have too many control issues for that. ha!) My rule of thumb is, if the colors don't make me cringe when they are placed next to each other, sew it up! In this quilt, I found I had to keep cutting more and more lights to balance out the darks, because I didn't want the quilt to get too heavy and dark. So far, so good! I think I'll leave it at that! I hope that you give this block a try! If you do, I'd love to see photos. I've been kicking around the idea of doing a series of 10 solid quilts for a few months now, so I guess today I am making it official! This is going to be a long term project, but it's one that I'm very excited about. I love having a challenge with parameters. The main reason is because it helps me focus! (And that's a very good thing.) Having limits is actually good for cultivating creativity...I've seen it time and time again in my own work. I enjoyed my one-a-day pincushion challenges, and before that, I did the 101 scrap project challenge. (Twice.) 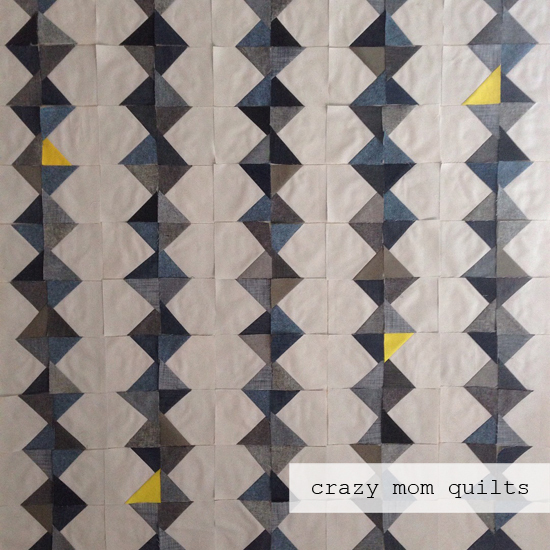 I'm looking forward to stepping it up a notch and doing a series of QUILTS. 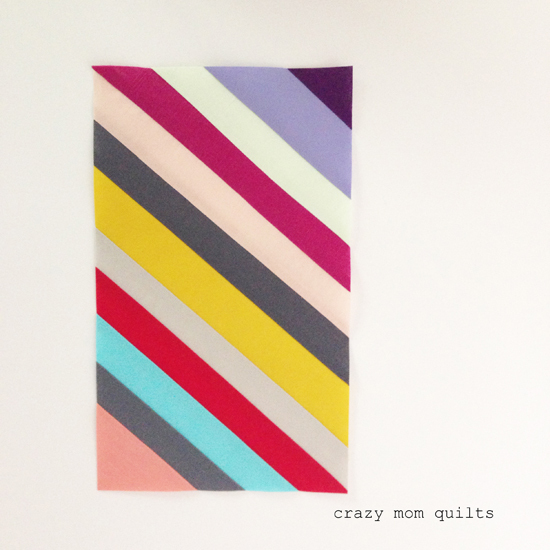 -I'm going to try to make a series of 10 quilts from solids. -The quilts can be any size, baby size and up. -The majority of them will be from the scrap bin, (no shock there!) but I'm allowing myself to supplement with my stash if need be. It would be amazing if I actually ran out of scraps!!! -They may be quilted by me or by someone else. -The quilts may also contain shot cottons, linen, chambray, denim and the like, as long as it reads as a solid/near solid. -I will allow myself to work on other projects as I'm working on this series. I haven't come up with a good name for my challenge yet, so if you have any great ideas, I'd be interested in hearing them. Yesterday afternoon I cut off a piece of batting from the roll and started laying out a BUNCH of 2 1/2" squares. 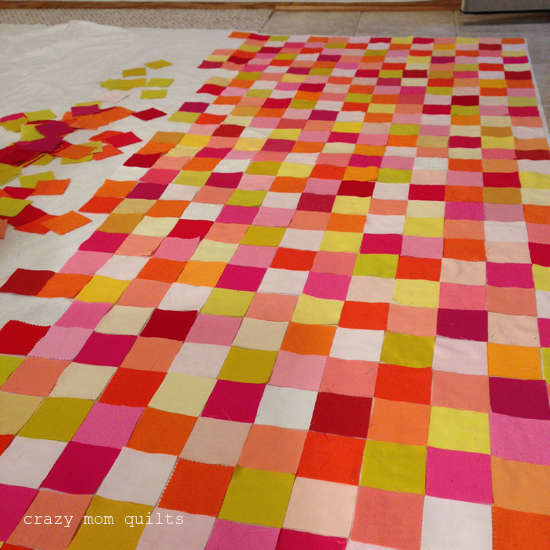 I'm making an alternate version of my hot & cold quilt from my book No Scrap Left Behind. I chose to use batting rather than my design wall so I wouldn't have to clear everything else off...realizing that it might be awhile before I get around to finishing this top up. 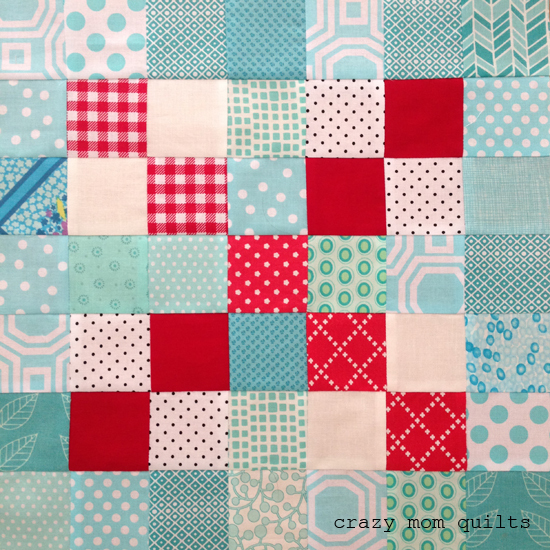 So far I really love this quilt! 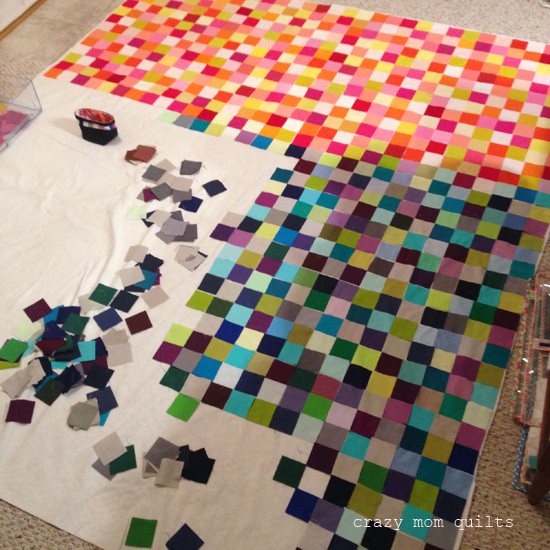 I'm not sure how I'm going to handle the dividing line between the warm and cool colors, but thankfully I have a few hundred squares to arrange before I have to decide! Ha! 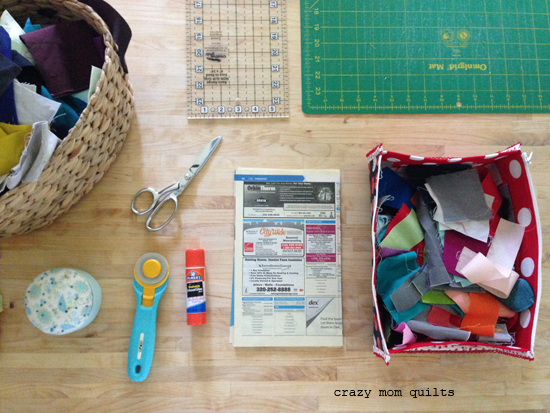 Have you ever worked in a series or gave yourself a personal sewing challenge? What did you think? Did you like it? Would you do it again? If you haven't, but would like to, what would your challenge be? I'd be interested to hear your thoughts on the subject! 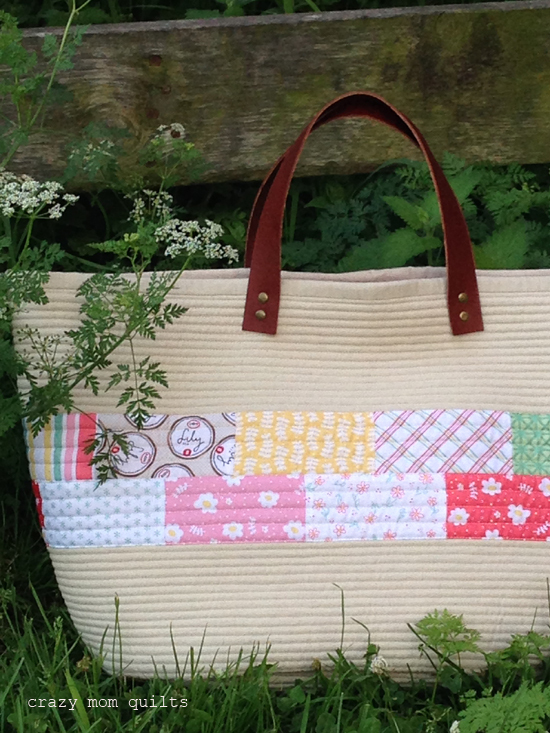 The pattern for the Market Bag is in Anna's book Handmade Style. I used my new fabric line, Emma & Myrtle, for the patchwork pieces. I thought it was a good pairing, keeping with the vintage style of the pattern. The background fabric is Essex linen. I've had it in my stash for many years, so it was great to finally USE it! I used leather straps in medium brown (available here) and Anna was kind enough to help with the rivets. (Thanks, Anna!) I love those extra touches like the leather and rivets. It gives the bag a professional look. 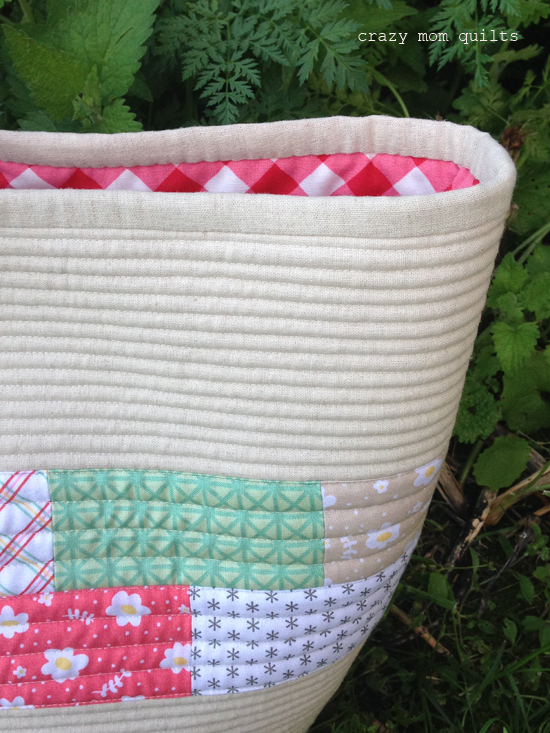 I also love all the quilting on the exterior of the bag. It takes awhile, but it's definitely worth doing. 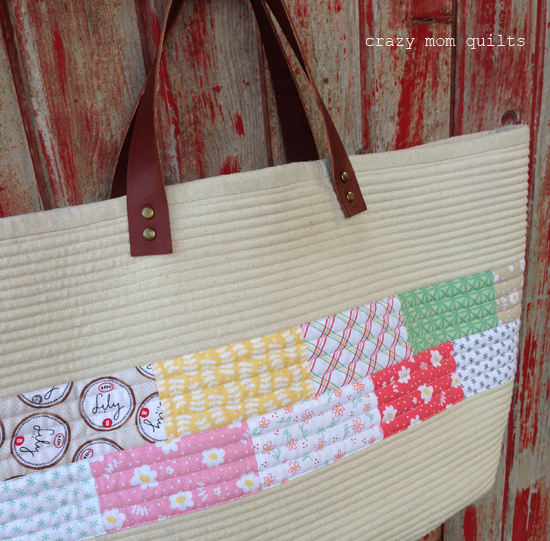 For the interior of the bag, I used leftover gingham backing fabric from this quilt. PERFECT pairing and I had it on hand. Yay!!! I hand stitched the binding down rather than machine stitch it, because I knew that I would get better results. It's totally a personal preference. I love this bag and I definitely recommend the pattern! Many thanks to my friend Holly for helping me style the photos for this post! I think that's it for me today! Now it's your turn to link up your finishes for the week. Remember that I am leaving the link up open for 2 days rather than 1. Hopefully that gives you a little more time to post something! 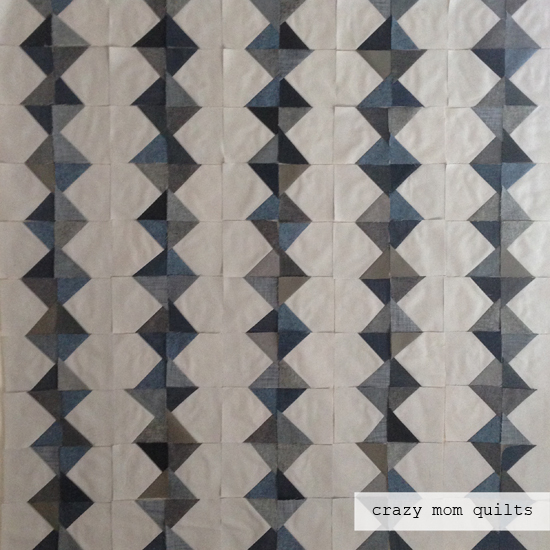 I have 13 blocks left to piece for my biased quilt, but I was feeling a little burnt out making those blocks, so I switched gears and pulled out my moody quilt instead. Variety is one good reason to have so many WIPs! Ha! 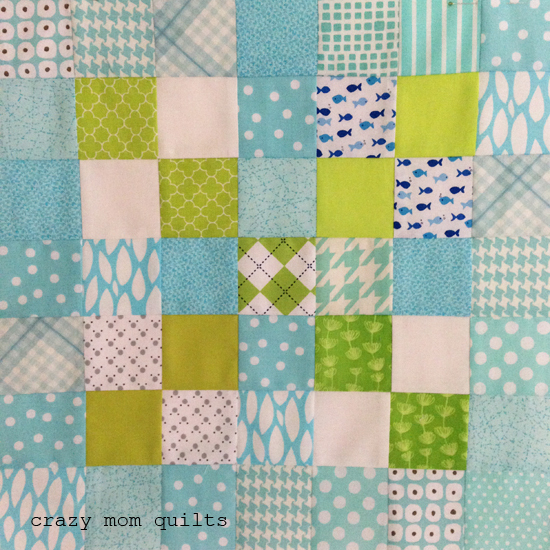 Anyway, I like this quilt and where it is headed, but I couldn't help but feel like it needed.....something. Maybe my next attempt will be just plain moody? I guess we will see! 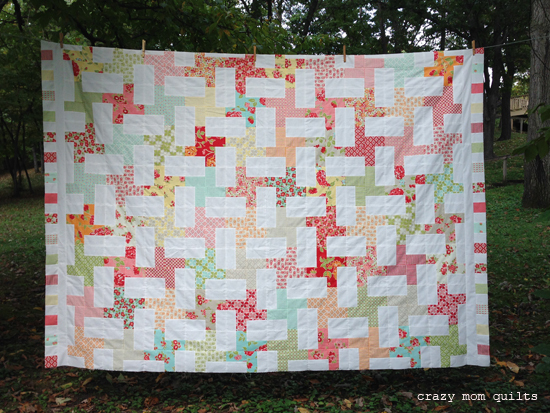 This pattern is an enlarged version of the chain of diamonds quilt from my book No Scrap Left Behind. 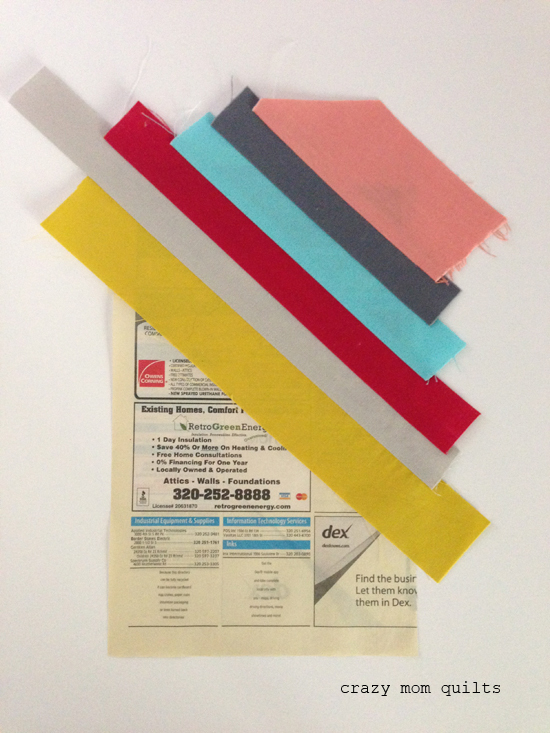 The background fabric is Kona Shadow and the scraps are various weights and substrates. (Linen, denim, chambray, etc.) 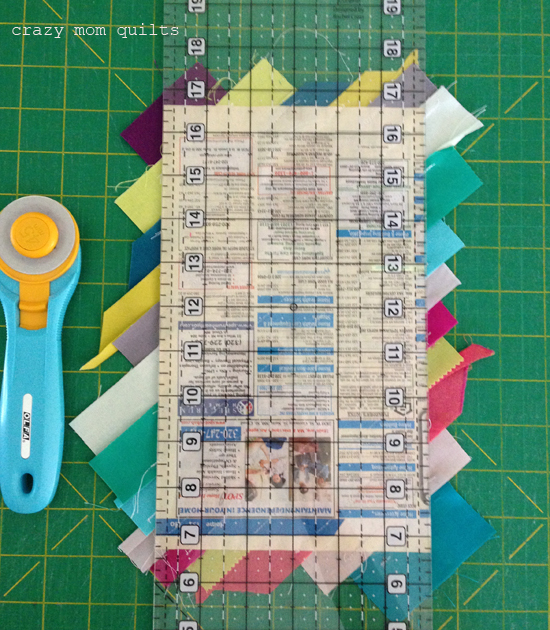 The background squares are cut at 4 1/2" so the individual blocks will finish at 4". I'm excited to see it transformed into a quilt top. Hopefully soon! Thank you so much for your entries in the range backpack pattern giveaway. That was fun! The winner of the pattern is barbaradougherty126. I also wanted to thank you for the warm welcome back after my month off. It's much appreciated! I hope your week is off to a great start. Happy Monday to you! I sewed this project during the summer, so it's actually been done for a couple of months, but I'm eager to share it with you today. 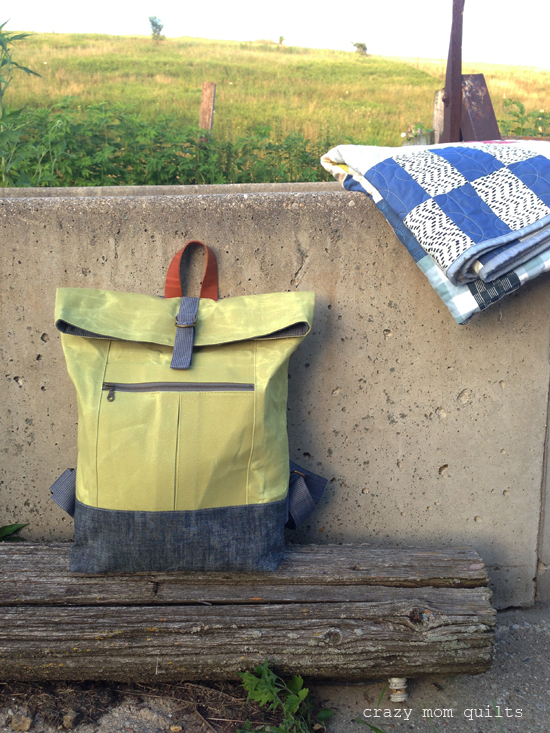 The pattern is called the Range Backpack by the amazingly talented Anna of Noodlehead. 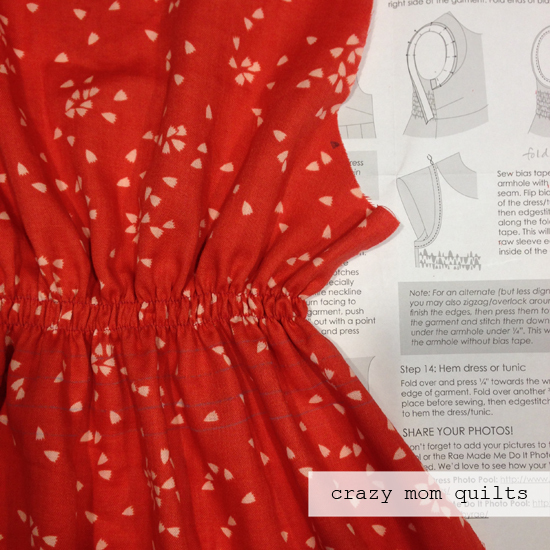 (The PDF pattern is available for purchase here.) Of all of the things that I've made, this is probably the project at the top of the list that makes me want to exclaim, "I actually made this!!!!" Hahaha! The pattern calls for waxed canvas, which I ordered from AL Frances on Etsy. 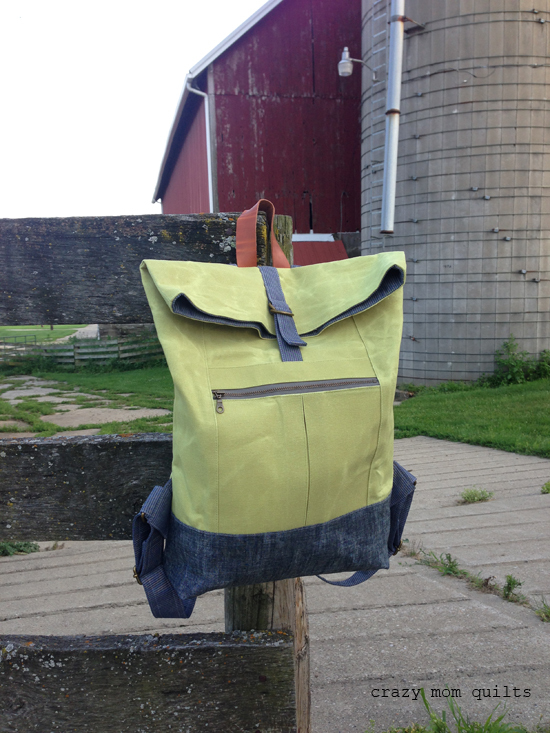 I used spring green and a blue denim for the exterior of my bag. I got the hardware kit from Anna. (It's SO handy that she stocks them...saves a lot of time and trouble trying to track everything down.) I had never used waxed canvas before, so I was quite nervous to sew with it, but it went well! It's fun to expand one's sewing horizons. Also, it's nice to have some hand holding and direction while doing it. Ha! The hardest part of the whole project for me was when it came time to turn the bag right side out. I didn't want to crumple the canvas....even though that's the whole point. The canvas gets better with age and with use. Breaking it in will be a challenge for me, I'm certain! As for the actual construction, I did that at a retreat with a few of my friends. 6 of us made our own version of the backpack, each one reflecting their own taste and style. 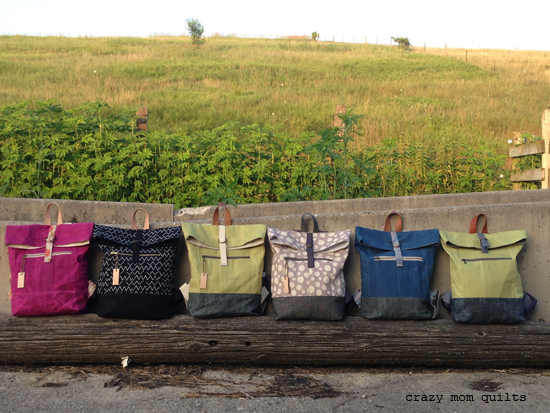 It was super fun to do the project together AND to get a group photo of all of our backpacks. I LOVE Anna's patterns because they produce such professional looking finished products. Every single time!! As soon as my kids saw it, each one of asked me if I would make them one. That's a good sign of success, I would say! I loved making it....and I felt a great sense of accomplishment when I finished. SO thankful to have been a part of the backpack party that we had at retreat. Switching gears a little bit....my oldest boy turned 17 yesterday! I'm having a hard time processing exactly how that happened. He requested carrot cake for his birthday, which I was happy to make for him. 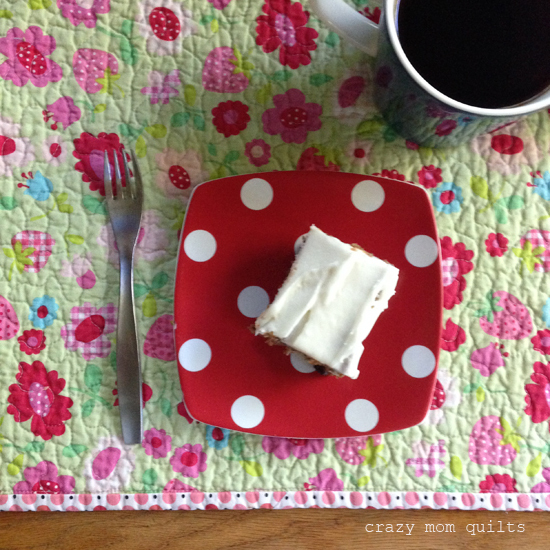 Having leftover cake for breakfast is a good way to start a Friday! 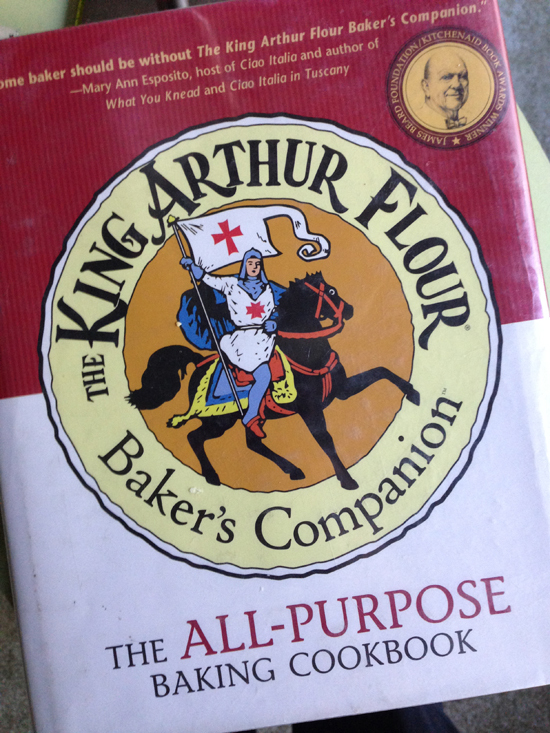 I picked this book up from the library a few weeks ago and I've tried 8 recipes from it so far (including the carrot cake recipe)... there is not a dud in the bunch! I can't recommend it enough! I thought it would be fun to do a little giveaway today! It's been awhile! If you would like to win a PDF copy of Anna's pattern for the Range Backpack, I will pick one lucky winner from the commenters today. I'd like to thank each and every one of you for stopping by my blog and reading. It really, truly means so much!